This handsome boy never fails when he's on sheep. Having taken home his share of HITs and RHITs, he is every trainer's dream. Batman has trialed in AKC, AHBA, and USBCHA. He loves to work his sheep, but is also very content to lounge around the house on his days off. Batman is registered with the Canadian Border Collie Association, and the American Border Collie Association, as well as the American Kennel Club. Batman has OFA Good hips. He is clear of Collie Eye Anomaly by DNA. 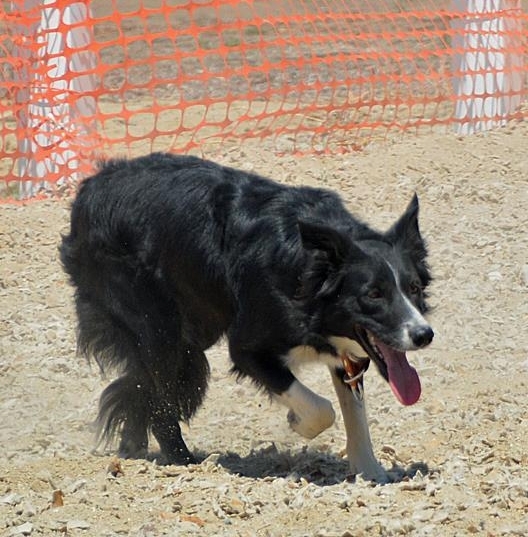 Arian Gar, "Ace the Bat Hound" has nine of the top ten border collies in his recent pedigree. He is a powerful working dog with lots of eye, and he knows how to get the job done. Sired by Richard Millichamp's Dewi Tweed, the 2009 International Supreme Champion. Off the field, Ace has a sweet temperament with good house manners. He is registered with the Canadian Border Collie Association and the American Border Collie Association, as well as the American Kennel Club. Ace has OFA Good hips. He is clear of Collie Eye Anomaly by DNA. When Spin arrives at a trial, everyone knows that this girl will be going home with some HIT or RHIT prizes. She works wonderfully, but she is also a very sweet girl. Spin has trialed in AHBA and AKC. Spin is the result of over two decades of careful breeding for working ability, drive, heart, and liveability. She is registered with the American Border Collie Association, as well as the American Kennel Club. Spin has OFA Good hips and is clear of CEA by parentage. Smoke hails from, On The Lamb Spinster, my line I've been breeding since the 80's on the dam's side. Canadian ranch bred on the sires side, IMP Batman. Smoke is an anomaly. She has trained, trialed and been winning faster than any dog I've worked with in many years, since On The Lamb Lass. The old soul, extremely willing to learn and please dog is more rare than not. Temperament and structure are perfect. Gets along with any person or dog. CEA clear by parentage, OFA hip clearance pending. ABCA 407099, AKC 41692404. A full sister to Spin.